Twitter is failing to keep place in the marketing game, though being a great platform for engaging with a large and influential audience. According to the report, on average, 6,000 tweets are sent on Twitter in a single second. This corresponds to 500 million tweets in a day. Twitter Marketing is tricky and has limitations. You only have 140-characters and there is no edit button, which means your single mistake could reach to millions in a second. That’s why it is important to play smart. And, if you play your cards correctly, you can gain all the benefits of this great social media platform. Here are 4 Twitter marketing brand examples to give you an impression of why it’s not the time to lay it off. It’s still powerful. Oreo is a commercial brand of cookies made up of two chocolate wafers with a sweet creme filling in between, and is promoted as “Chocolate Sandwich Cookies” on the package. Oreo’s (‎@Oreo) new Oreo Chocolate Candy bars had hit the market, and it was looking for ways to increase the world’s appetite for its launch. It entered in the IMDb Oscar party live stream. With the specific goal to reach millions of famished viewers and reach a new audience for ‎#OreoChocolateCandy, Oreo sponsored Twitter’s IMDB Live Viewing Party. Oreo created a campaign that would run before, during, and after the IMDB Oscars live stream. It also dialed up its cultural importance and added to conversations around the Oscars by creating Moments, capturing highlights from the live-streamed party. Oreo promoted a 30-second teaser video engaging viewers to the live viewing party and introducing them to its ‎#OreoChocolateCandy. During the Oscars, Oreo promoted the live stream to a targeted audience to bring new audience to the show. With a non-skippable pre-roll ad running before the live stream, Oreo raised awareness for ‎#OreoChocolateCandy. Oreo embraced Twitter’s real-time nature to increase exposure for the ‎#OreoChocolateCandy. Oreo’s In-Stream Video Ads during the live stream supported its overall ‎#OreoChocolateCandy launch while raising its brand awareness to a new group during a significant cultural event. Oscar’s audiences create conversations while lively between TV, Twitter, and other digital mediums. Twitter is a key channel for brands to become a part of these conversations. Target Corporation is the second-largest discount store retailer in the US. Target (‎@Target) wanted to understand how interactions with people on Twitter affected brand loyalty and perception. They wanted to know what impact these relations have on its brand image amongst people who are not directly involved in a contact but see it due to Twitter’s public nature. Twitter surveyed a cross-section of Target customers who use to measure how ‎@Target‘s interactive approach impacted brand insight. They carried out a Nielsen Brand Effect study to further study these effects on a promoted campaign. This kind of research helps brands understand how their relations change what their customers. The public nature of Twitter means that communications are visible to all users and a customer’s problem being solved or an entertaining, fun interaction can create a positive view of a brand. Connecting with people forms an emotional attachment that can positively impact people’s willingness to pay. 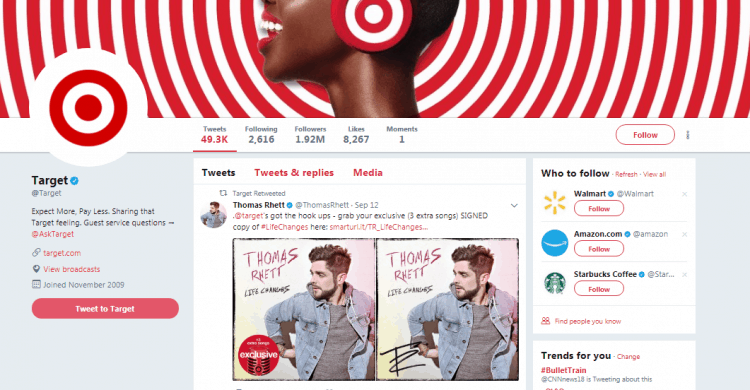 A well-managed Promoted Tweet campaign that engages users can entice even irregular users to shop: they created an 8% increase in shopping intent amongst those who shop only once a month with Promoted Tweets. The research proves that the most effective formula for building positive brand feeling is Promoted Tweets plus communication. Promoted Tweets that boost users to respond and a brand that responds to these Tweets create positive relations with the brand much more successfully than promotion alone. Motorola created the mobile communications industry and exists to invent, build, and deliver the best mobile devices on the planet. Motorola was looking for a new and innovative way to promote the new Moto Z smartphone, which consists of snap-on modules called Moto Mods that add a camera, an extra battery, a JBL speaker, and other features. Motorola wanted an innovative and unusual way to show off this unique smartphone to its audience. Twitter partnered with Motorola creative agency Ogilvy & Mather and Public is Media’s Motomentum to create ‎#InASnap, which used First View, Promoted Trend, and a custom finger snap emoji. This campaign was created to highlight the innovative features of the phone to users who were looking for a new device, and to inspire them to rethink how they might use a phone that offers more flexibility. In addition, Motorola used conversational ads to reward its audience to respond by offering a Moto Z and Moto Mods package as a prize. This was paired with an on-the-ground activation on the New York High Line that let people get hands-on time with the Moto Mods. By presenting the new features of the Moto Z in an innovative way, ‎#InASnap”>‎#InASnap made people take notice of the new features. The campaign inspired users to imagine how they can use Moto Mods by illustrating how they could integrate the mods into their lives. 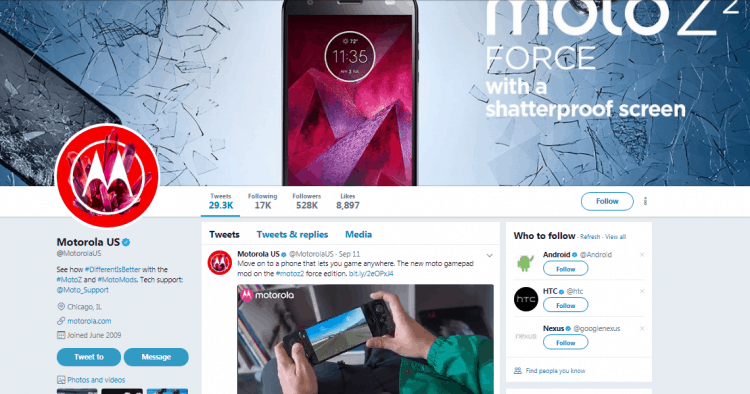 By sharing related content with customers in the market for a device or mobile mod, Motorola was able to better gauge purchase intent among its target audience. Toyota (‎@Toyota), wanted to deepen its relationship with a progressively important audience: Latino millennials, who publish and interact with concert-related social content at a higher rate than other groups. They took this insight and sponsored two summer music events: Chicago’s Lollapalooza and San Francisco’s Outside Lands Music & Arts Festival. With ‎@Toyota’s longtime Hispanic marketing agency ‎@Conill, Twitter became essential in strengthening the relationship with the target audience. Also, Grammy-nominated Mexican singer-songwriter Ximena Sariñana (‎@ximenamusic) was the perfect campaign partner because of her social influence and status as a past performer at the festivals. Toyota Latino (‎@ToyotaLatino) monitored conversations on Twitter throughout the 10-day period and responded in real time to fans engaging with both ‎@ximenamusic and the brand. “We looked at Tweets that tagged ‎@ToyotaLatino and hashtagged ‎#VayamosJuntos. Toyota was able to own virtually all Latino social chatter surrounding the festivals by partnering with only Latino performers at the events, including popular Colombian band Bomba Estéreo (‎@bombaestereo) and Francisca Valenzuela (‎@franciscamusic), an American-born Chilean singer-songwriter, poet and multi-instrumentalist. ‎@ToyotaLatino targeted Promoted Tweets to keywords such as the festival hashtags ‎#OL2014 and ‎#Lolla. It also used ‎@username targeting to reach users similar to the followers of such artists as ‎@bombaestereo. Paid media supported Tweets with dynamic and interesting content during ‎@ximenamusic’s journey to the concerts.